Significant advances in digital photography have created unique opportunities for law enforcement agencies to more accurately document incidents and increase officer productivity. It has also produced a greater need for agencies to find a better way manage their fast-growing digital photo collection. Once again, PUMA worked with recommendations from local law enforcement agencies in designing our new products by finding out what practices they found most useful when dealing with their digital-image management workflow. From crime scenes, auto accidents, booking or gang-related photos, PUMA DPM management software provides management, storage and access to all your department’s digital images. Once again, PUMA worked with recommendations from local law enforcement agencies to find out what practices they found most useful when dealing with their digital photo management workflow. PUMA DPM is easy to use. Officers and investigators can easily upload their photo from any cameras, memory card or PC folder to the PUMA DPM System. Once the images are transferred, key information about the photos can be added. Allowing patrol officer, investigators, CSI or SIU agents to transfer their own digital photos will produce more accurate accounts and documentation of the images. PUMA DPM provides desktop photo management capabilities from any PC in the department, which provides officers, investigators and others, better access to images to aid in investigations. 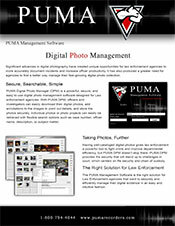 When viewing images, PUMA DPM has tools that allow the user to zoom-in, magnify rotate and print images. Images can be burn to a CD/DVD or sent to the District Attorney or Prosecutor. Significant advances in digital photography have created unique opportunities for law enforcement agencies to more accurately document incidents and increase officer productivity. It has also produced a greater need for agencies to find a better way manage their fast-growing digital photo collection. 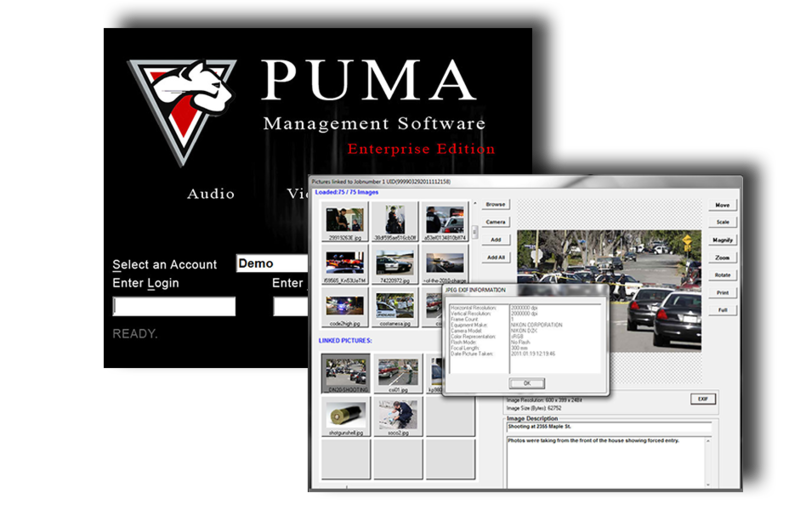 PUMA DPM is a powerful, secure, and easy to use digital photo management add-in for the PUMA Management system designed for Law Enforcement agencies. 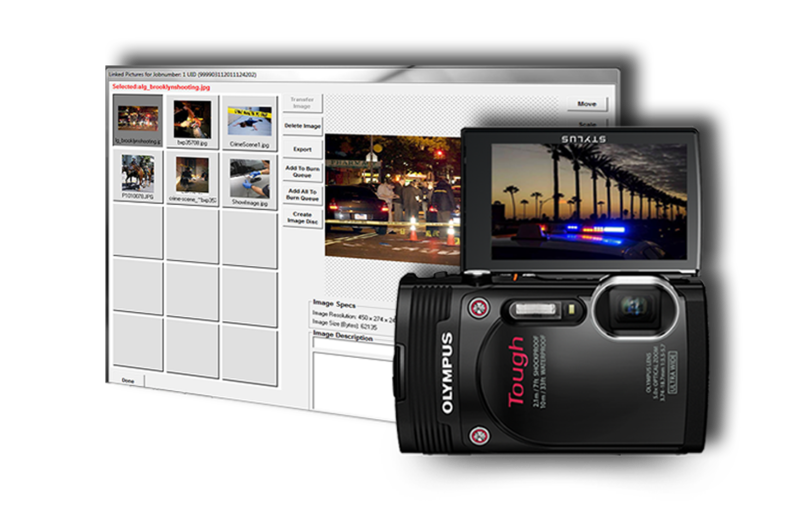 With PUMA PM, officers and investigators can easily upload their digital photos, add annotations to the images to point out details, and store the photos securely. Individual photos or photo projects can easily be retrieved with flexible search options such as case number, officer name, description, or subject matter. Having well-cataloged digital photos gives law enforcement a powerful tool to fight crime and improve departmental efficiency, but PUMA DPM doesn’t stop there. PUMA DPM provides the security that will stand up to challenges in court, which centers on file security and chain of custody. Upload digital images from any camera, media card or PC folder. Easy to use photo uploading process. Accepts all digital image formats. Flexible search option such as date, case number or detail description. Annotate images with key information. Attach digital photos to audio files when available. Acquires all data related to the image. Exif data – includes camera make/model, image resolution, color representation and date picture taken. Flexible security levels and access rights to view images. Detailed audit trail and file encryption with 256-bit AES encryption.